Track Academy deliver a high quality, affordable and holistic training programme to local communities, aged 10 (primary year 6) to 21 years old, which is not matched anywhere else in Europe. We help the most deprived children and young people in London fulfil their potential in life through sport and have been transforming their lives since 2011. We provide a strong emphasis on three disciplines of athletics: ‘Run, Jump, Throw’, with the introduction of group swaps to encourage the development of inter-group communication to widen experiences of the student athletes. 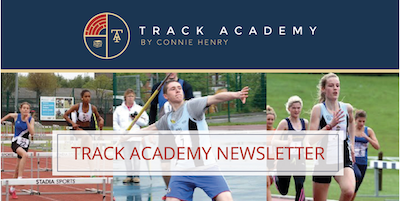 Track Academy not only host indoors and outdoors meets twice a year, but also encourage athletes to compete in fixtures track and field events locally; South of England and Nationals competitions ranging from U13, U15, U17, U20, U23 and seniors. Track Academy is affiliated with a registered competing club based London. Athletes are issued with an (England Athletics) EA number which is uploaded onto the ‘Power of 10’ website, when competing. The ‘Power of 10’ provide UK targets and ranking positions and is known to motivate competitors, coaches and clubs. Once a year, an opportunity of a life-time, senior athletes are invited to train aboard amongst elite international athletes with their coaches. Warm Weather Training overseas, is not a holiday camp, but a training camp to gain learning experiences of new techniques, a chance to discovering strength and abilities in warmer climates as well as an opportunity to re-charge and focus on techniques and speed drills. This need was based upon research, which indicated that by the time children reach secondary school age, their physical activity levels will have already peaked and are actually declining – making it challenging to re-engage them and increase their levels of physical activity (Health and Social Care Information Centre, 2013). Therefore, Track Academy took the decision to open these new sessions up to 8 -10 year olds, targeting school years 3 – 5.The Multi-Skills division at Track Academy was created on 7th June 2016, following an identified need to lower the joining age at the academy. Sport, Health and Exercise knowledge through interactive workshops. In terms of competition, the programme targets the annual trio of Indoor Minithons held at Lee Valley Athletics Centre, where athletes get the opportunity to compete in three athletics events across one afternoon. For many, this is their first experience of an official athletics competition beyond a school environment. At Track Academy, we host an annual Indoor and Outdoor Competition, allowing our youngest athletes to showcase their talent to the rest of the academy and beyond. Lastly, each year the Athletics calendar includes an international competition where all of the top athletes in the world compete i.e. Olympics, World and European Championships and Commonwealth Games. Within the Multi-Skills group, we host an internal competition allowing athletes to feel like they are a part of these great sporting events. Health and Social Care Information Centre. (2013). Health Survey for England 2012: Physical activity and fitness. The Information Centre: Leeds. 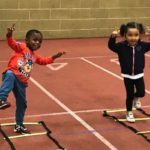 Introducing the Track Academy Toddlers programme, a bespoke series of fun, interactive and educational athletics sessions for toddlers up to 4 years. Track Academy have branched into the world of tots, combining our sporting expertise and our Education and Mentoring Programme to provide sessions that grow and sustain tots abilities both physically and developmentally. On average, tots make the transition from walking to running between 18 and 24 months old. After that, they just want to RUN! Typically, it is recommended that toddlers get at least 30 minutes of structured (adult led) physical activity and 60 minutes of unstructured (free play) physical activity. The Track Academy Toddlers Programme channels that energy so that our toddlers are well engaged in safe physical activity and that is fun and informative. The 12 week RUN, JUMP, THROW programme has our tots dabbling in each athletic discipline from week to week. Our tots explore the muscle and bone structure of the human body through warm up activities, eventually matching and making connections between their anatomy and their movements, in engaging ways they can understand. The programme is coached by Track Academy’s very own Athletics coaches and run and co-ordinated by a dedicated team of sports enthusiasts.